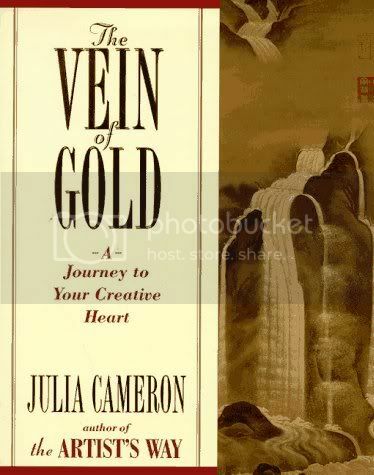 The third kingdom or chapter in “The Vein of Gold” is related to sound. Sound is powerful and can be used in many ways to heal the individual. Ms. Cameron suggests washing in sound, building a sound shield, setting moods, and using silence as exercises to help us get in touch with ourselves. Washing in sound is a technique you may already use to clear your mind after a hard day at work or school. Putting on music to help ‘wash’ away the stress you feel. You may choose the sound of soothing waves or the sound of Native American drums. Or you might head straight for the loud and cathartic rock music. It’s a tried and true method teenagers have used for years to blow off their ‘controlling parents’. This task was easy for me. I already have CD’s burned for each of my moods and keep them in my car. By the time I’ve finished the commute from work I feel better and more relaxed. I use Enya and Sarah McLaughlin to soothe me, their music can be very much like lullabies. They cradle me in their beautiful melodies, using lyrics that help center me. Screaming along with Linken Park and Nickelback help me vent frustrations. They allow the rage I feel to surface and dissipate in the safety of my car, not at home on unsuspecting family members. My AFI and 30 Seconds to Mars albums encourage me to whine and pout, literally. Pounding on the steering wheel and shaking my head. NOTE: I drive home in the early hours of the morning when there are few other drivers to see the ‘crazy lady’ in the car next to them singing at the top of her voice. You might need to wait until you arrive home to begin your ‘washing’, or at least be less obvious as you listen to your music in traffic. Sound can also be used to build a shield around you. Sitting on a crowded train you will be bombarded by the conversations and bustle of those seated next to you. Putting on your iPod and listening to your choice of music can create a bubble around you, a ‘shield’ if you will. It will protect you from the influx of noise and allow you to think your own thoughts, to focus on your book or laptop. It is one more way to use sound for your well being. A friend of mine uses the Red Hot Chili Peppers to keep the world at bay as she commutes, allowing her to use the time productively. Music can create a mood, more effectively than any other medium. The images Hitchcock used in his infamous ‘Psycho’ shower scene would be infinitely diminished without the screeching strings of the background music. The deep bass sounds that signal the entrance of the shark in ‘Jaws’ induce more fear than the pictures onscreen do. Even if the viewer turns away, they are still at the mercy of the music. Good filmmakers know and use this fact. Use music as your own soundtrack. One type of music might help you feel safe, another more likely to take chances with your life or your art. Experiment and see what happens. The absence of sound can be powerful as well. “It’s so loud I can’t hear myself think!” is a literal statement. Silence allows the mind to let perceptions and ideas trot themselves out and BE noticed; without being pushed to the side by louder and more insistent cares. One of the exercises was to make our own ‘Silence Task’. I have tried doing the commute to work in silence, the drive home I ‘wash in sound’. At first I found the silence uncomfortable. What am I supposed to do with no music, no one to talk to? But soon my thoughts began to take over. Where am I going to take my next chapter? How can I best deal with my son’s poor grades? Why do I allow people to make me feel less? In silence, insights come to us. Silence allows our thoughts freedom to wander, and they will wander where we need them to go. Stillness brings to light the beauties-and pains-we keep suppressed. Religions use silence to help their followers focus and gain inspiration. Prayer, in its most powerful form is silent; between the individual and the Creator alone. Monks take vows of silence and Native Americans take solitary spirit journeys to learn from this potent instrument. To heal the blows of sound.” Oliver Wendell Holmes, Sr.
As human beings, we use sound constantly. Caroling at Christmas time, singing hymns in church, crooning lullabies to children are all good examples of this. Everyone has a ‘workout’ playlist for the gym and learned to read by singing the alphabet song. Sound is universal. Sound is therapeutic. Sound is intrinsic to our well being. Try these exercises and use sound for your own benefit. Wow, E. What an incredible essay. I really appreciate how you’ve brought together all the ideas with your own experience and show ways that the reader can implement them in their own practice. It’s clear that you are growing and learning a lot from this process which is such an inspiration. That was a great post, E and thank you for sharing glimpses of the insights ahead to those of us further back on the JC journey! I definitely LIVE in the kingdom of sound. Both music AND silence are tools I use frequently. As I’ve mentioned before, my headphones are my most essential piece of writing equipment. I design playlists based on the current mood I am trying to set in my WIP. Or, like you said, they can be therapeutic too. Silence is how I relax and re-center myself. And my mind definitely turns on too when things are silent. I have a hard time getting to sleep most nights because in that half-sleepy state where everything is quiet and calm, some of my best ideas come to me and scenes replay in my head. I’m looking forward to that book when I get through TAW. And for the record – you have *awesome* taste in music!! Thanks Gwen!!! Did you know the new Nickelback CD comes out any day now?? Guess what’s getting a lot of new play time in my car? It’s obvious that you have great taste in music too! Again I find myself agreeing with you, concerning your bubble it a wonderful way to escape the world and much preferable to the bustle of everyday life, be careful you aren’t murdering your hearing though!